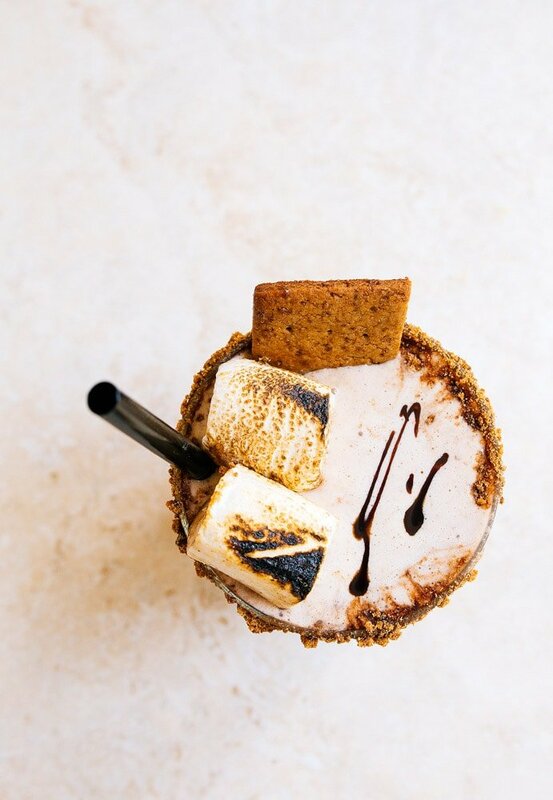 S’mores milkshake for two. Make it from scratch, or take help from the store–your choice! This post is sponsored by the National Frozen and Refrigerated Foods Association, also known as NFRA. See EasyHomeMeals.com for more recipes & tips. I made dinner entirely from scratch the other night. My dinner happened to be a s’mores ice cream shake made with homemade graham crackers, homemade chocolate syrup and a small batch of homemade marshmallows. But still! Homemade things need to be celebrated! I declared it the best homemade dinner we’ve had in ages. The only thing I took help from the store on was the ice cream, but that’s just because I can’t make a vanilla bean ice cream the way Breyer’s does. I buy a container of Breyer’s Natural Vanilla (the one with vanilla bean!) almost every week during the summer months. It’s good on peach cobbler for two, it’s good with chocolate sauce on top, it’s good with mini raspberry pies and it’s very good in this s’mores milkshake for two. With July being National Ice Cream month, you best stock up. 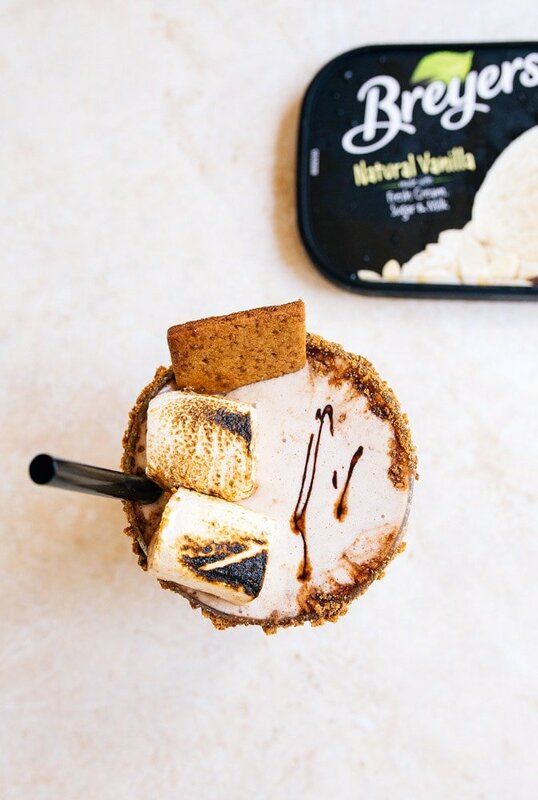 But here’s the thing: I want you to have a s’mores ice cream shake in your face by any means possible, so I want you to use store-bought grahams, marshmallows and chocolate sauce if that makes it happen for you. One fun little trick for this shake: let it rest for a few minutes after blending. This will soften the graham cracker chunks and make them a little more slurp-able. I also choose not to crush the graham crackers before blending, because I think the cracker bits are the best part. Oh, and if you like your s’more oozing with chocolate, you’re going to need to add more than I did. I did a quick glass drizzle of chocolate because a s’more for me is all about the toasted marshmallow and grahams. But an extra spoonful of chocolate syrup in the blender is amazing. 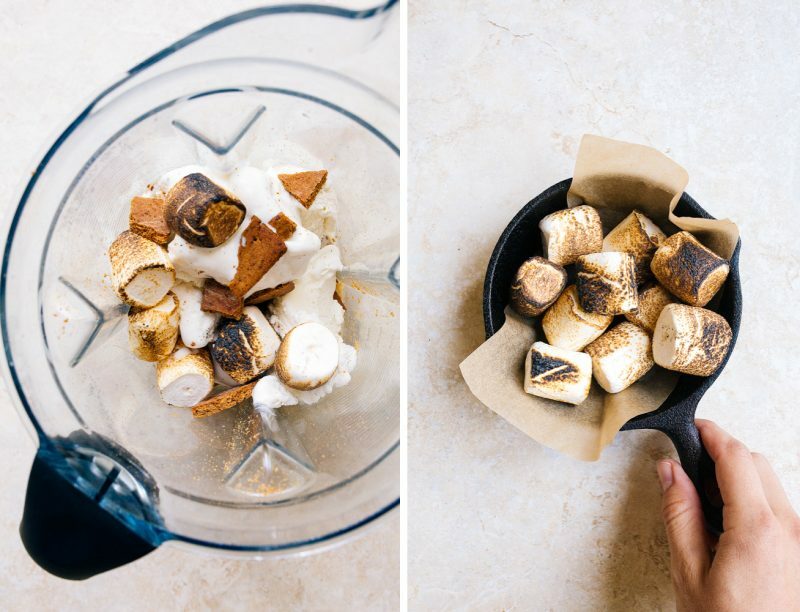 Let’s talk toasted marshmallows! Did you know you can make them with a culinary torch? Yep, the same one you use for my slow cooker creme brulee. I just thread my marshmallows onto a chopstick, and then torch them to my liking: half black, half toasty brown. I hope this shake makes your summer even sweeter. 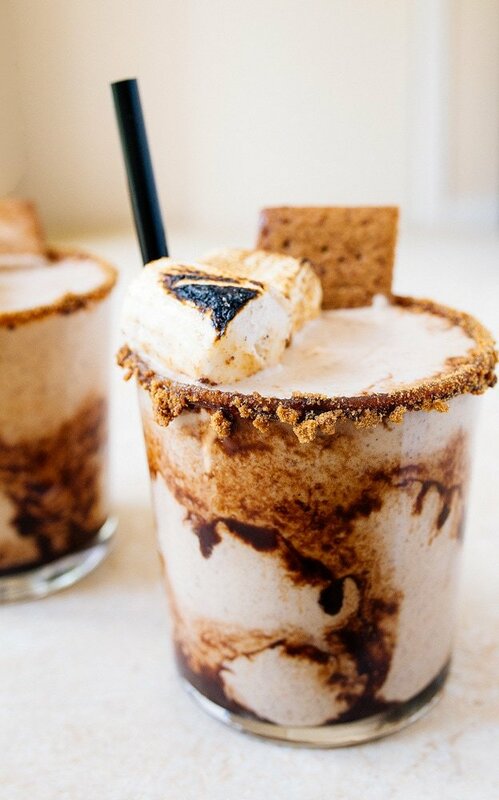 S'mores ice cream shakes with homemade graham crackers, marshmallows and chocolate sauce. First, thread the marshmallows on a chopstick or skewer, and use a culinary torch to toast them to your liking. Set aside. Next, make the chocolate sauce (if you're not using store-bought): combine all ingredients except the vanilla in a small sauce pan. Bring to a simmer while whisking constantly. Remove from the heat and stir in the chopped chocolate until melted. Stir in the vanilla, and then let cool completely. 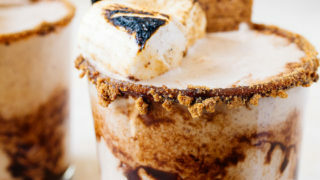 To make the milkshake: combine the marshmallows, ice cream, graham crackers and milk in a blender. Blend until mostly smooth. Let rest for a few minutes to soften the graham crackers. Meanwhile, drizzle chocolate sauce inside two 8-ounce serving glasses. Divide the milkshake between the two glasses. Serve, garnishing with extra marshmallows, if desired. You can also dunk the rim of the glass in chocolate syrup and then crushed graham cracker crumbs. We would not. And even if we did, who cares??? It’s your skake not ours. Sounds amazing. Thank you for sharing all your amazing recipes!! Oh my….this looks AWESOME!!! On the menu for this weekend for sure!! Yum! What kind of chocolate? Unsweetened? Bittersweet? Semisweet? Milk? All? The milkshake looks amazing, I will try them now! These photos are making me drool! This looks absolutely fabulous!